Nissan Infinity auxiliary audio input interface for radios with satellite or sat ready Direct connect 2 external audio sources to your Nissan radio, iPod/iPhone, Mp3, XM Sirius, Smart phones, or any portable audio source. Expand your Nissan Infinity radio by adding virtually any audio source. 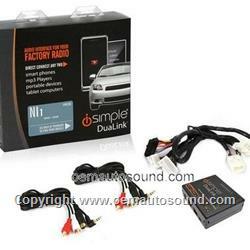 The simple Dual ink is a revolutionary solution designed to connect new audio source to the factory installed radio. The auxiliary interface allows you to connect up to two additional audio source and feeds the audio directly into the radio while retaining the factory installed satellite radio. The interface creates an unmatched listening experience by combining the audio source you have with the freedom and individuality that only comes from your automobile. Radio must have "Sat'' button or have "Ch. ", "Cat" "Channel" ,"Cat" or "Category" printed somewhere on the Nissan Infinity radio. This is usually located near the tune or seek buttons. In 2004-2006 Infiniti vehicle equipped with factory satellite tuner will have to be disconnected at the tuner location in order for the aux interface to work correctly.